Until this house with our fixed up formal dining room… I NEVER talked about a “tablescape”. Now… I regularly channel my inner Eddie Ross and I LOVE it. If you’re hopping over from the amazing Shine Your Light… you should know right off the bat, that I’m not *nearly* as kind and wonderful as Lisa. But I set a lush Easter table, so WELCOME! Here’s my tablescape disclaimer… I’m a maximalist. I love mixing and matching and bringing in lots of plants. 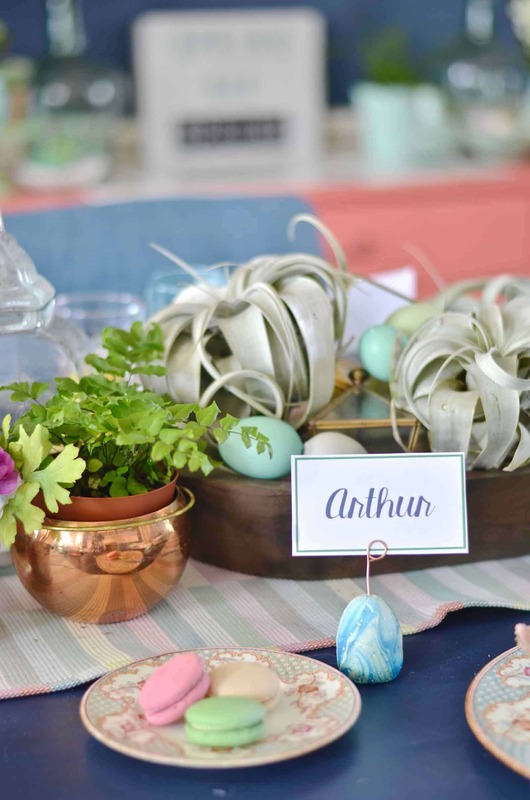 And this Easter table is NO exception. I started with the color scheme from the rest of the spring tour (corals and greeny aqua) and then I kept adding layers. The place setting is a fun combination of the old and the new. I have my great-aunt’s GORGEOUS formal china and have paired it with a $.99 Ikea white bowl. I honestly can’t remember where the blue glasses are from… they’re similar to these ones (affiliate link). 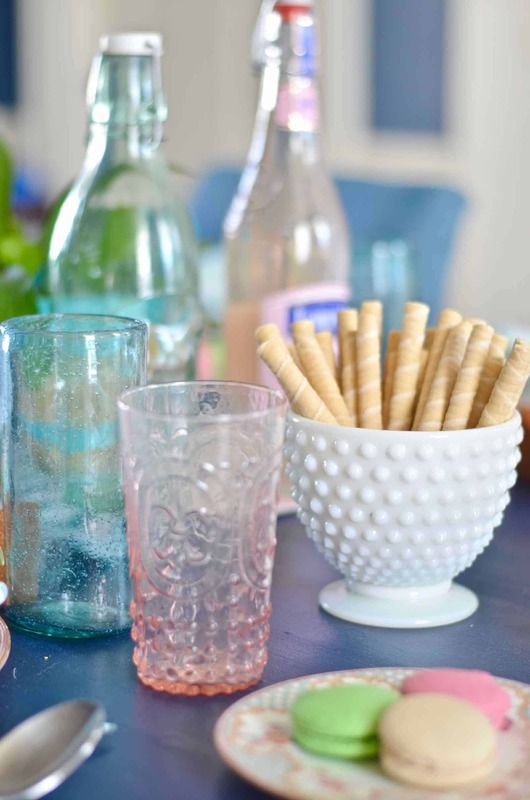 The rose glasses are these votives from Luna Bazaar, and the lucite silverware…. etsy. 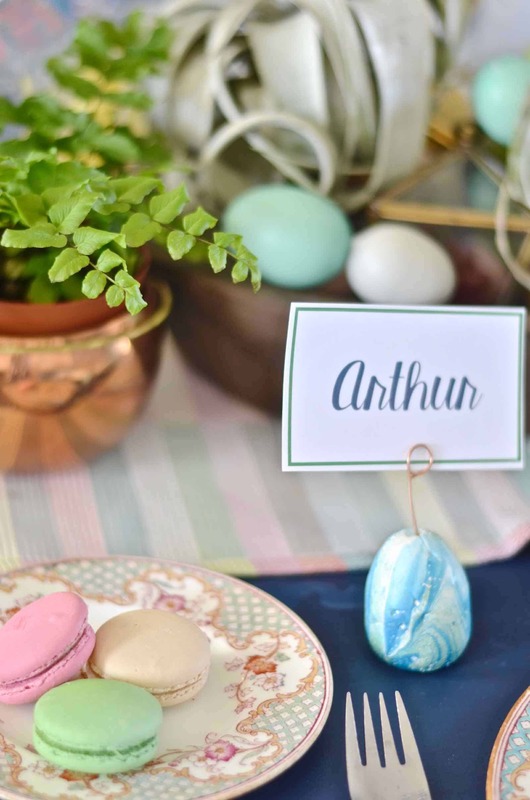 I shared the tutorial to those sweet marbleized Easter Egg place card holders last week. And when I saw those glittered carrot treat boxes at Marshalls, well they’re getting filled with jelly beans for Easter! 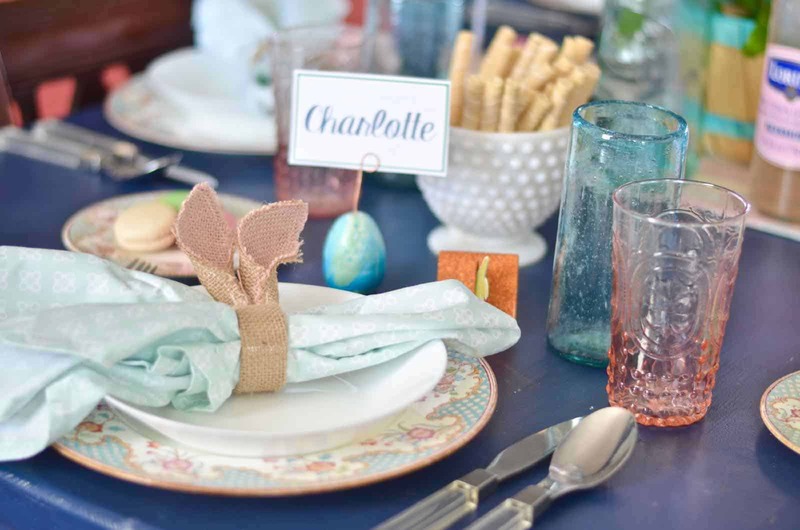 My favorite detail of the place setting might just be those adorable rabbit ear napkin rings. Not only are they my color of the spring, blush pink, but they’re also cute without being cutesy if that makes any sense! Moving onto the centerpiece… my design process with a centerpiece is basically pile up all the stuff that I like within my theme. For this table, that meant plants and pastels! 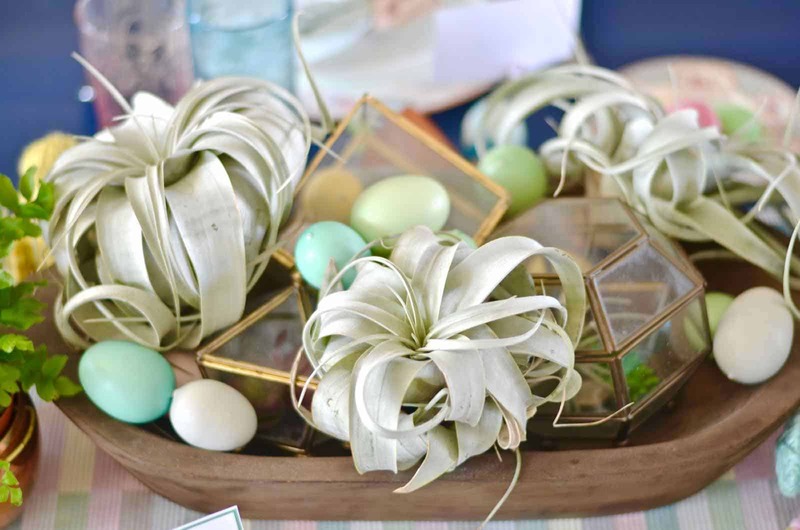 I piled a bunch of my faux airplants into thrifted copper glass boxes and then added speckled eggs and some real air plants (affiliate). 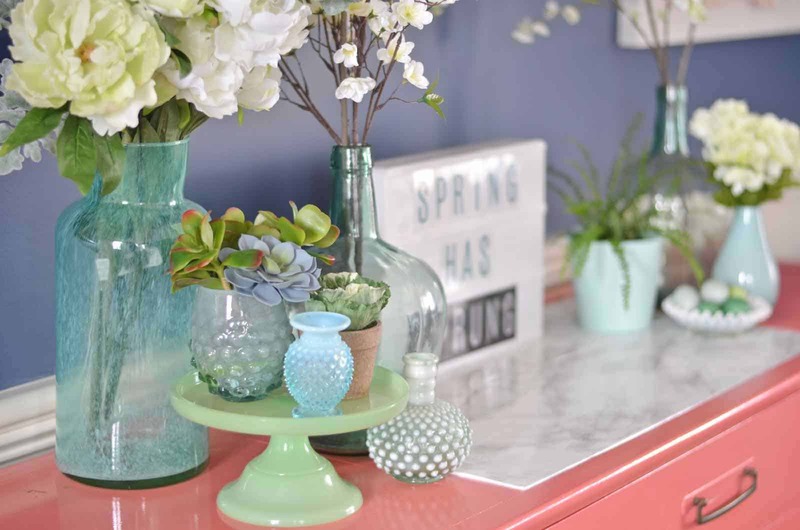 The sideboard is similarly lush with an assortment of aqua glass and more spring flowers. 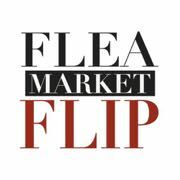 Most of that glassware is thrifted but… these are some almost identical options (affiliate): here, here and here. Did I mention I LOVE macarons? They come in the prettiest of colors and are a favorite of mine when entertaining or hosting a special occasion! 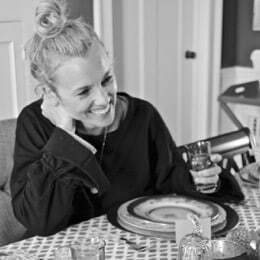 To see the dining room reveal, click here. I made over this room as part of the One Room Challenge so you can see the full process! But wait… there’s more! 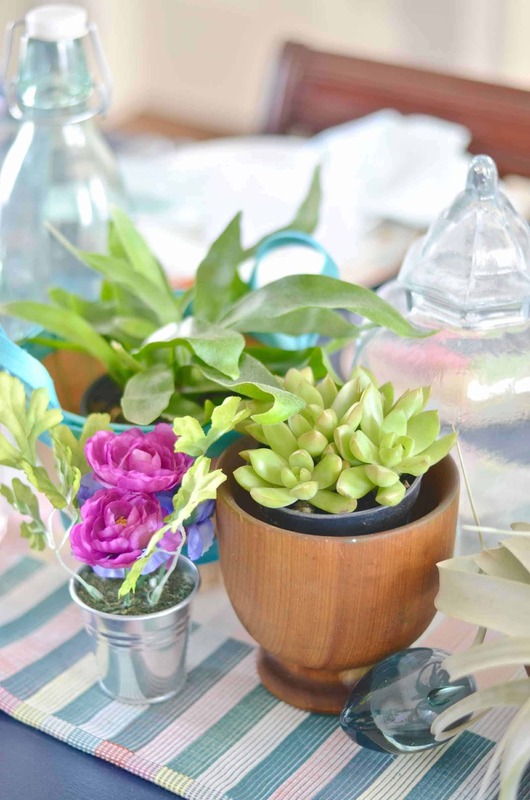 Head on over to my friend Brenna’s to see what amazing table scape she’s cooked up. Brenna actually COOKS so you can bet her table will be spectacular! (You’ll noticed at no point did I mention what I would be *serving* for Easter lunch… that’s still TBD and possibly involving grilled cheese.) 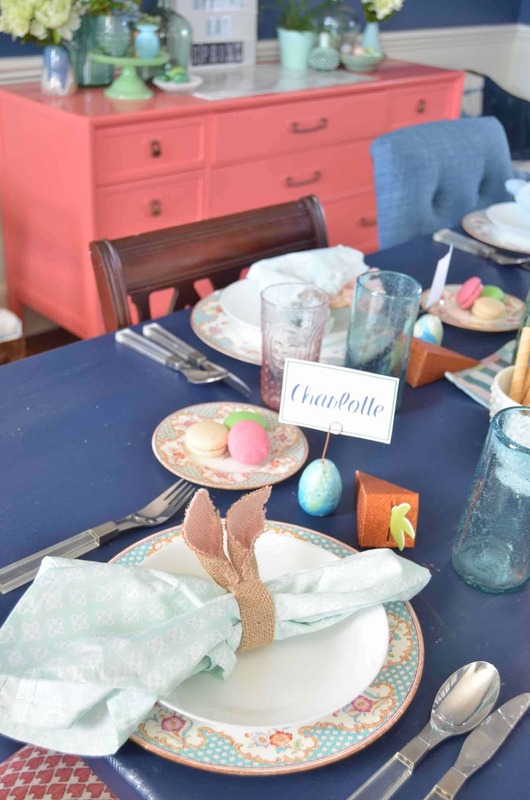 And while you’re at it… here are all the other lovely tablescapes being shared today! 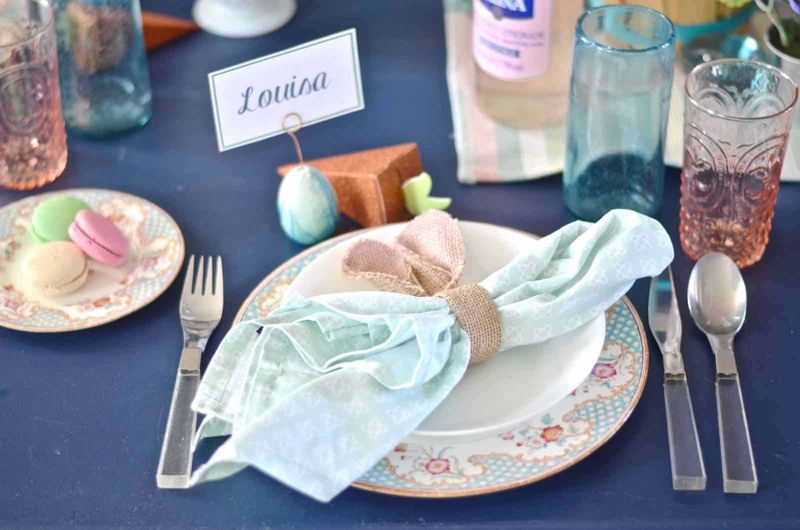 Those bunny ear napkin rings are adorable! 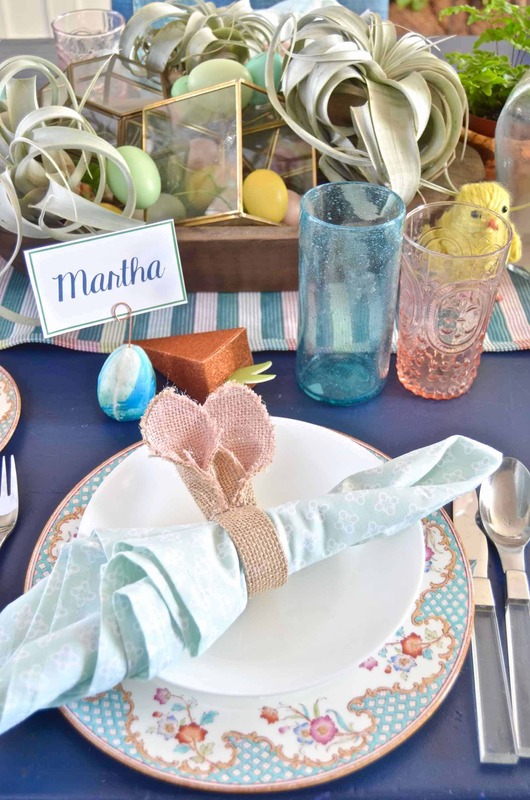 Such a sweet family Easter table! Aren’t they adorable? I mean… with 40% off, they HAD to come home with me! Thanks for organizing! Great as ALWAYS. quick question, will you keep all the cute stuff on the table when all the kids are sitting there? (or do you all eat there as a family?) 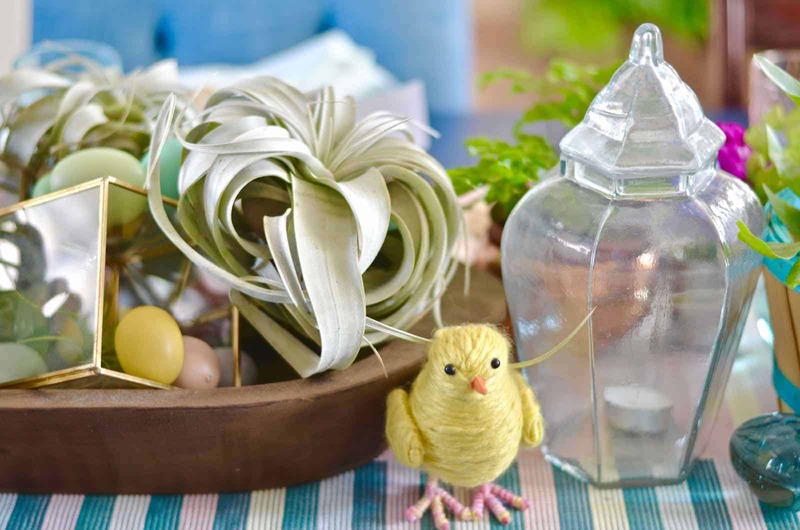 My now 13 year old would be in heaven picking and futzing with all of the cool plants and eggs… can’t imagine all your littles sitting and the eggs not ending up EVERYWHere. BEautiful! I’ll probably move the inherited China for the littles… I bet the 2 big kids could handle it. As for the other stuff on the table… I bet they can’t even reach! 🙂 But that may be a game time decision. THANKS! So pretty! 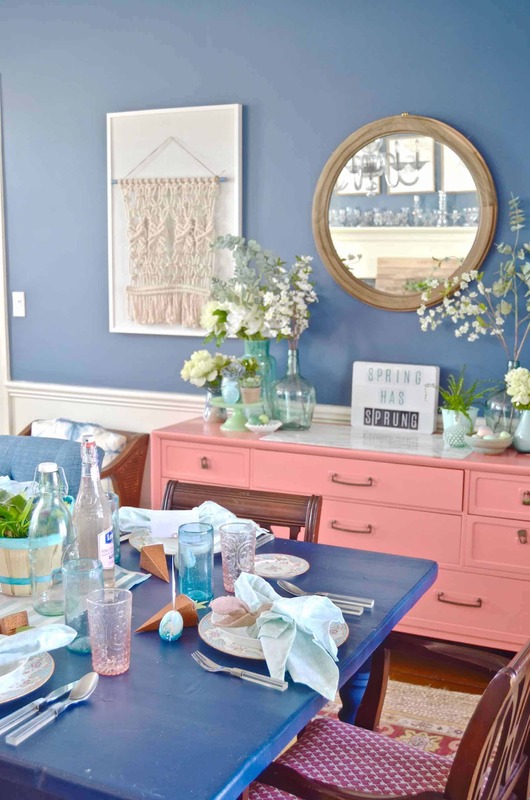 Love all the mix of pastel colors! Haha! 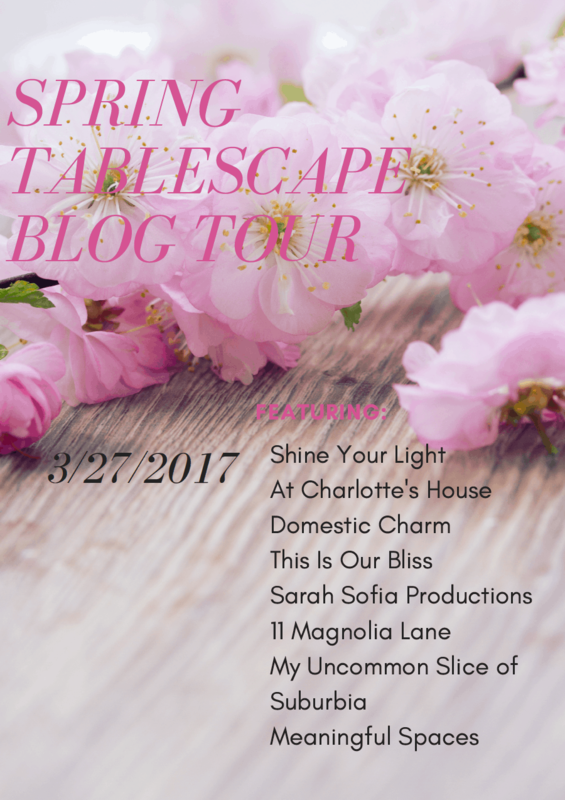 I’m feeling the lovely blush color that’s everywhere lately… And thanks! More is MORE when it comes to a table in my mind… still lots of room for improvement, but simplicity never seems to be my jam. Thanks for organizing this fun tour! Everything is so BEAUTIFUL, love the glassware! 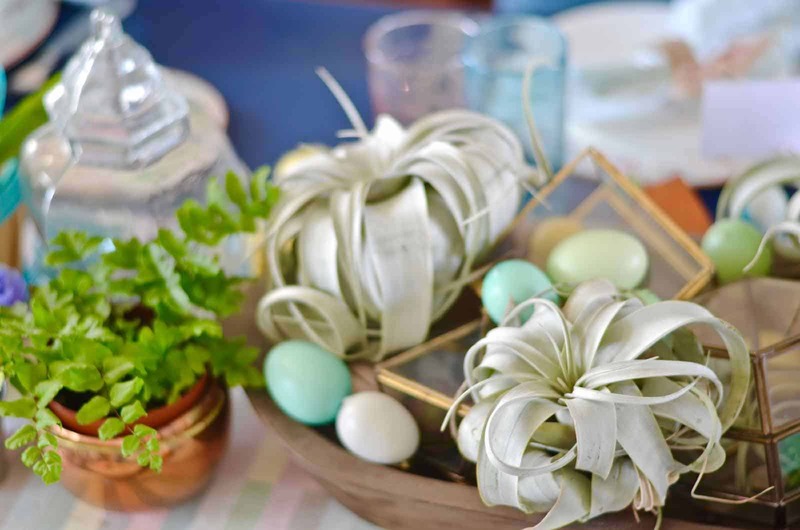 The airplants, the glassware, the namecards and colors…yep!! Love it ALL! And yes, we’ll all be over for the grilled cheese and Captain Crunch. Please add 4 more spots to the table ha! Yay! How fun would that be in all seriousness? 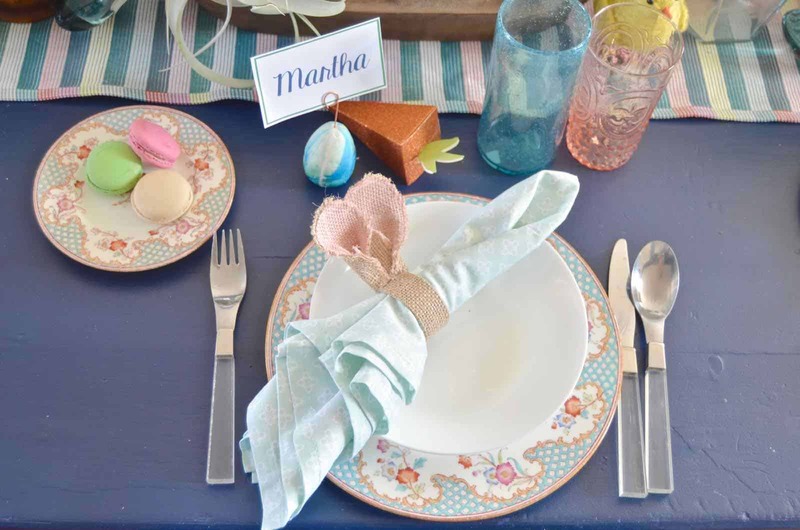 With Easter Sunday right around the corner I am frantically trying to find the perfect Easter tablescape. 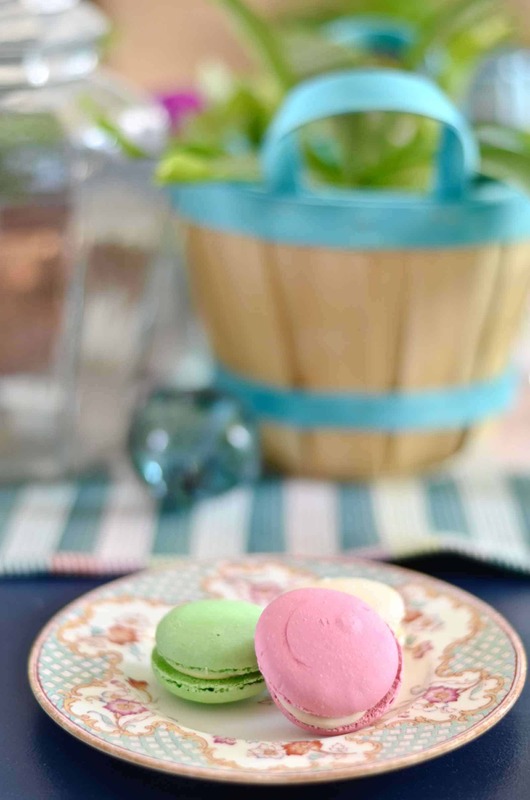 I love the myriad of colors that are on this table, especially brought in by the macaroons. So cute. The video also helped to see all of the details your incorporated. You’re so sweet! I think the video helps too and am excited to add more of those to my room reveals in the future! Thanks!